While the United States is building a global missile defense system, Russia is preparing for a radical renewal of its strategic nuclear missile arsenal. It looks like the Russian military and the military-industrial complex have decided to prepare seriously for overcoming the American missile defense system. Work is underway simultaneously on two strategic missiles of different classes. According to Sergei Karakaev, the commander of Russia’s Strategic Missile Forces, these is a heavy, 100-ton, liquid-propellant intercontinental ballistic missile (ICBM) that should outperform the world’s most powerful R-36M2 Voevoda (NATO reporting name: SS-18 Satan), and a solid-fuel ICBM scheduled to replace the fifth-generation Yars systems (the RS-24 and the Topol-M). “Since the potential of solid-fuel ICBMs could become insufficient for overcoming the American missile defense system going forward, a heavy liquid-propellant ICBM is needed to perform this task. Such an ICBM will allow the creation of a non-nuclear, high-precision, strategic weapon with a practically global range, unless the United States abandons its program,” Karakaev said. This is the first time Russia has spoken about creating a new solid-fuel missile. According to Gen. Karakaev, several launches of a prototype of this missile took place in 2012 – most recently on Oct. 24. This puts an end to the debate on whether Russia’s Strategic Missile Forces need a heavyweight liquid-propellant missile. Russia undertook a large-scale modernization of the Topol family in the 1990s and adopted the Topol-M silos (NATO reporting name: SS-27) in 2000, followed by the mobile Topol-M2 several years ago. 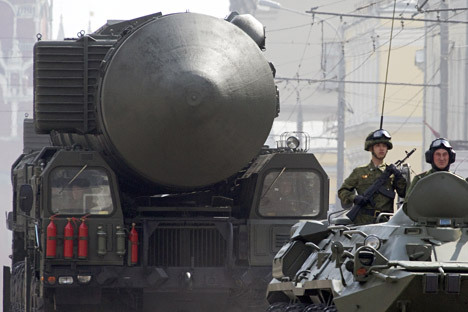 It is the new Topol and the newly adopted RS-24 Yars that will be gradually replacing the decommissioned, first-generation, solid-fuel missiles. But liquid-propellant missiles still form the backbone of the strategic deterrence forces: the UR-100N (NATO reporting name: SS-19 Stiletto) and the Р-36M (U.S. Department of Defense and NATO reporting name: SS-18 Satan). These, however, are obsolete and will have to be retired over the next few years. New missiles have been slow in arriving to the Russia’s armed forces. According to an estimate by Leonid Kalashnikov, deputy chairman of the State Duma Defense Committee, Russia could receive 100-105 new ICBMs by 2015. If the bet remains on, the single-warhead Topol-M and the three-warhead Yars-24 would be able to carry a total of 110-115 warheads. At the same time, the United States is planning to deploy 900 ballistic missile interceptors worldwide by 2015. The United States withdrew from the 1972 Anti-Ballistic Missile Treaty in 2001 and is no longer limited by any restrictions on building up the quantity and quality of such means. According to Karakaev, it is possible that America could deploy anti-missile defenses in space. Russia’s military and political leadership was counting on successful negotiations with the United States on missile defense. However, the negotiations have ended in a deadlock; Washington’s persistent deployment of surface- and sea-based anti-missile defenses, coupled with a general deterioration of bilateral relations, have forced the Russian leadership to consider more decisive actions. This is where the idea of a missile capable of carrying a dividing warhead with a large number of individually targeted blocks (which would also have a long range) originated. Russia already has such missiles – the above-mentioned liquid-propellant UR-100N and R-36M. However, these missiles have been on combat duty since the late 1980s, and their service life is nearing an end. Development of new missiles was suspended in the 1990s, when the Strategic Missile Forces were expected to be fully converted to lightweight, solid-fuel missile complexes. However, lightweight missiles have not been able to become a full-fledged replacement for liquid-propellant giants. Nonetheless, Russia is not planning to abandon its solid-fuel missiles either. Solid-fuel missiles are the best match for mobile complexes. This means that Russia will continue developing a replacement for both types of its active-duty missiles.